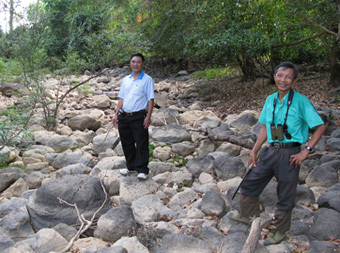 Above: Park Director Mr Thanh shows Mrs Vo Tuyet Mai (Director of VBS) the power of the Dong Nai river in spate ... a large branch broken off and suspended above their heads clearly demonstrates the role of trees to protect the banks from erosion. 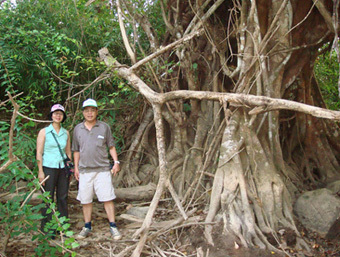 The Park is managed by a team of dedicated and knowledgeable staff. They are well aware that protecting the land means involving the local people - but this often involves difficult negotiations. 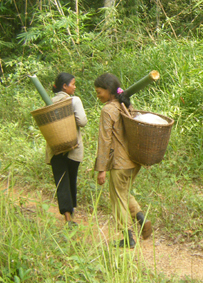 Several ethnic communities, including the Chau Ma (Maa') and Stieng people have lived in the central valley of the reserve for several centuries, and several hundred people are currently resident. Visitors to the Park may wish to take a day trip to visit one of these communities around Talai, to the south of the park. 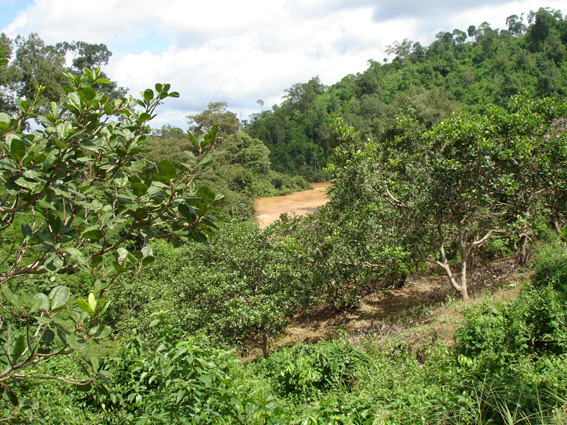 Pressure on land: growing cashew in an adjacent agricultural area across the Dong Nai river.